A beloved symbol of Warsaw, this long-standing monument has been a constant fixture throughout the city’s tumultuous history. The Warsaw Mermaid Statue (Syrenka Warszawska) is associated with one of Poland’s best-known romantic legends. Visit the Old Town Square to see the iconic monument and learn about the intriguing tale behind it. Ask locals about the myth behind the mermaid. Legend has it that long ago a mermaid was swimming up the River Vistula toward Warsaw when she decided to take a break. The fishermen of Warsaw were taken with her beauty and singing voice and when she was later imprisoned by a rich and evil merchant, one of them came to save her. As a sign of her gratitude, she pledged to protect all fishermen after that and by extension, the people of Warsaw. Head to the center of the square to examine the sculpture, which stands atop a modest fountain. Note how the mermaid, known locally as Syrenka, is holding a sword and a shield. As the protector of the city of Warsaw, she is always ready to fight. On her lower half, she has not one, but two tails where her legs would otherwise be. The mermaid has appeared on Warsaw’s coat of arms since the 16th century and many representations of her can be found in the city. Look for other mermaid statues around town, including those on the Stanisław Markiewicz viaduct and Grochowski Street. The statue standing in the square today is not the original, but a modern zinc cast copy. The original bronze mermaid, created by Konstanty Hegel in 1855, can be seen at Warsaw’s Historical Museum. Bring along a camera as the Old Town Square is a beautiful place to take photographs, especially in winter when the Mermaid Statue is covered by lights. Stop at one of the nearby cafés for a drink or browse the souvenir shops around the square. The Warsaw Mermaid Statue is found on the Old Town Square. To get here, take the tram or bus to the Stare Miasto stop. Admire the views from the terrace of the country’s tallest building, a controversial landmark that inspires mixed feelings from Polish citizens. Learn about the defining days of war in Warsaw at this enormous museum, which traces the Home Army’s doomed attempt to liberate the city from its German occupiers. A former royal residence, this stately building is now home to a fine collection of historic artwork and furniture. Dominated by a towering column and the beautiful façade of the Royal Castle, this grand square is an ideal starting point for exploring Warsaw’s Old Town. Check out this quirky art project that has unexpectedly become known as a symbol of Warsaw. A center of religious life in Warsaw, this historical church is at its most atmospheric when filled with the stirring tones of its huge pipe organ. Admire the impressive collection of historic artwork and furniture housed inside this grand 17th-century palace. An essential stop on the Royal Route, this lavish church is reminiscent of an opulent palace and its bell tower offers breathtaking views of the city. Built in tribute to a 16th-century Polish king, this landmark overlooks the busy Castle Square and is a popular meeting place. Browse centuries’ worth of art treasures, many of them rescued from the clutches of war, in this striking modernistic building. Build bridges, fly a spaceship and uncover the mysteries of the universe at this fascinating museum. Delve into Jewish and Polish history and gain an insight into Jewish culture in this award-winning interactive museum at the heart of Warsaw’s old Jewish quarter. Learn about military history and pay your respects to fallen soldiers at this center of religious ceremony for the Polish Army. 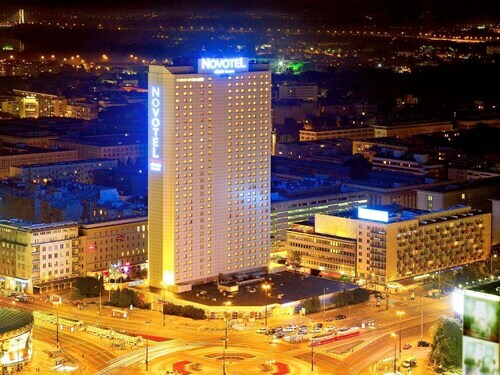 Located in Srodmiescie, this hotel is within a 10-minute walk of Galeria Centrum and Palace of Culture and Science. U.S. Embassy and Warsaw University of Technology are also within 1 mi (2 km). Centrum is 5 minutes by foot and Warsaw Central Station is 11 minutes. 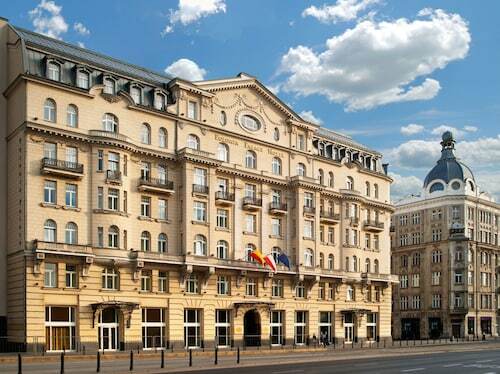 Polonia Palace Hotel is situated just 350 meters from Warszawa Centralna station and 15 minutes from the Złote Tarasy Shopping Centre. Warsaw’s Old Town is only 2 km away. Located in Old Town, this luxury hotel is within a 5-minute walk of St. Anne's Church and Royal Castle. Old Town Market Place and Old Town Square are also within 10 minutes. Centrum is 26 minutes by foot and Warsaw Gdanska Station is 27 minutes. Located in Old Town, this luxury hotel is within a 10-minute walk of New Town Market Place, Old Town Square, and Old Town Market Place. 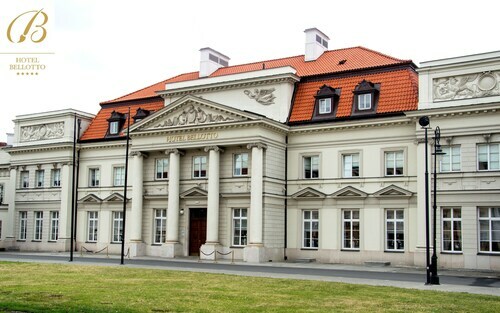 Royal Castle and University of Warsaw are also within 1 mi (2 km). Warsaw Gdanska Station is 15 minutes by foot. 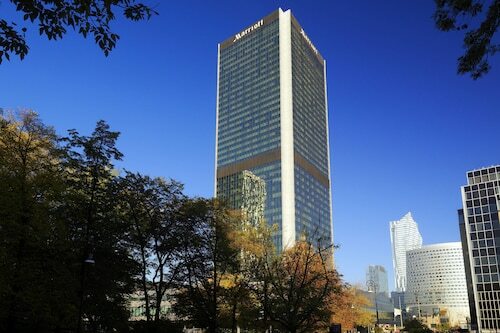 Warsaw Marriott Hotel is opposite Central Station and a 2-minute walk from Centrum tram, and 5-minute walk from the metro station. The Palace of Culture and Science is 3 minutes from the hotel on foot. Sightseers will want to visit Old Town Market Place and the Royal Castle, both within a 10-minute cab ride away. 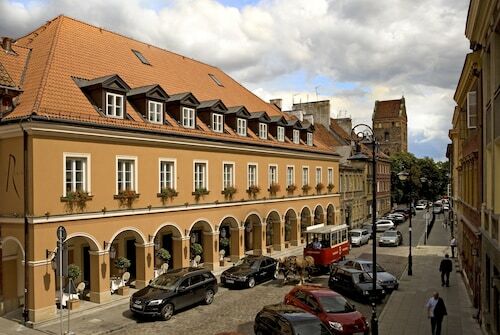 Centrally located in Warsaw, this hotel is near Royal Castle, Old Town Square, and St. Kazimierz Church. Additional nearby points of interest include Warsaw Uprising Monument. 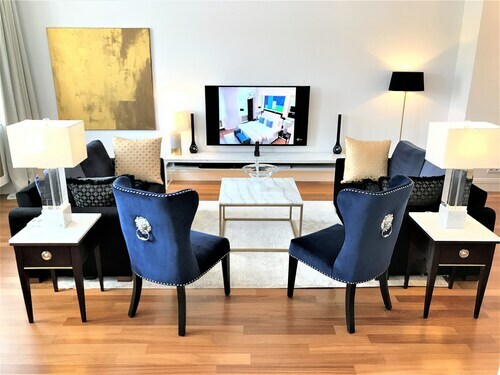 This family-friendly Warsaw aparthotel is located on the Strip, steps from Warsaw Mermaid Statue, Old Town Market Place, and Old Town Square. Royal Castle and University of Warsaw are also within 1 mi (2 km). Warsaw Gdanska Station is 22 minutes by foot. Housed in multiple buildings in the Old Town district of Warsaw, Old Town Apartments are walking distance from Old Town Market Square and the Royal Castle. The Central Railway Station is within 4 km.